Silverstone is gearing up for not one, but two spectacular events this weekend (21-22 August). In addition to hosting round seven of the Dunlop MSA British Touring Car Championship, featuring qualifying on Saturday and three races on Sunday, a host of aerobatic stunt teams and iconic aircraft will take to the skies as part of the ‘Silverstone Air’ weekend. 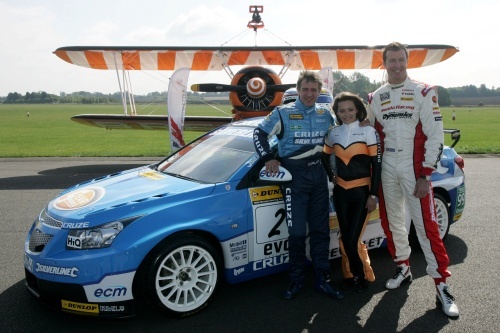 As a fitting preview to Silverstone’s action packed double-header, current BTCC Championship contenders Jason Plato and Matt Neal joined the Breitling Wingwalking team at Turweston Aerodrome, near Brackley, for a ‘wingwalking’ lesson. Championship leader Jason Plato and a nervous looking Matt Neal were taken out of the comfort zone of their race seats, and safely strapped to the wing of a 1940 Boeing Stearman – used originally as a WWII ‘trainer’. Instructed by Breitling Wingwalker Danielle Hughes, who will be performing at Silverstone this Saturday, both drivers were exposed to the elements as they reached speeds of 130 mph at heights of up to 500 feet. The BTCC legends enjoyed their unique ‘wingwalking’ experience and adrenaline rush, despite the turns, climbing and diving that pilot David Barrell treated them to. Honda Racing Team driver Matt Neal said, “I desperately thought I can't be a wuss and hold on all the time. What an unbelievable experience! It was pretty terrifying but it was amazing. I just can't believe they do it for a living. My legs are still shaky, and there is a lot of leg to shake! What we have been doing must be basics in comparison to Danielle’s wingwalking skills. During the British Touring Car weekend itself, the Breitling Wingwalkers will be joined by The Red Devils, Red Arrows, Aerostars, a Vulcan bomber, Lancaster bomber, Spitfire, and P51 Mustang as they perform aerobatic stunts over Silverstone Circuit, as part of Silverstone Air.